Campaign For Universal Health Care In Colorado Seeks Bernie Sanders' Help : Shots - Health News An initiative on the state's November ballot would establish a single-payer health plan. Supporters hope to lure Sanders to help get out the vote. "I believe that health care is a right, not a privilege," Sen. Bernie Sanders told Denver supporters in February. ColoradoCare supporters hope to leverage his charisma for a win on their state amendment. With the Democratic National Convention in Philadelphia behind him, Sanders "comes to Colorado and campaigns for single-payer — and we win," says T.R. Reid, one of the architects of ColoradoCare. The initiative aims to provide every resident of Colorado with affordable health insurance. Sanders made universal coverage one of the cornerstones of his presidential bid. Reid says the backers of ColoradoCare have pitched Sanders' team, hoping he will campaign on behalf of the measure that will come before voters in November. "I believe that health care is a right, not privilege," Sanders told cheering crowds. He also beat that drum during a TV appearance with MSNBC's Rachel Maddow in May. Sanders pointed out that Canada started what would eventually become its nationwide system of universal health care by persuading lawmakers in each province — one province at a time. "So if you're asking me, do I think if a major state — whether it's Colorado or California or whatever — goes forward and it works well, [will] other states say 'Hey, you know, I got a brother over there in Colorado and he's getting health care, great health care and it's less expensive than the current system,' " Sanders said. "Yeah, I think that is one possibility." "I think we're just at such a tipping point," Kleiman says. "The momentum of Bernie's campaign carried over into something like this would be a perfect fit and pretty necessary." Kleiman says if Sanders actively backed the proposal in Colorado it would help motivate millennials like him to vote. Reid agrees. "The last poll showed 60 percent of millennials support ColoradoCare," he says. "Those are Bernie people and if he can turn them out to vote, we win." But a coalition of opponents, including conservatives, insurance firms and business groups, has come out against the initiative, which is expected to draw big money from both sides. "I don't think the economics of it work out," says Nina Anderson, a small business owner in Grand Junction. She says the proposed program would be too expensive for small businesses and employees. Colorado has been on the cutting edge of some other big policy changes, like legalizing recreational pot. Anderson says she's not ready for the state to take the lead on a huge government-run health care system, and does not think Sanders should jump in. "That is the scary part, I think, about being in Colorado and being on the forefront of anything that is attempting to move to socialized care," Anderson says. "You do get everybody with outside interests coming in and playing in your sandbox." Cody Belzley, who served as senior health policy analyst to former Democratic Gov. Bill Ritter, opposes the proposal and says she's not sure what difference Sanders would make — if he did come. "It's such a strange political year," Belzley says. "I think it's really hard to know what's going to impact Colorado voters or the outcome of Amendment 69. I think this is a decision to be made by Colorado voters, based on what's going to be best for them and their families." Colorado voters haven't passed a general tax increase in years. Obamacare cut the state's uninsured rate in half, but many residents still struggle with high premiums and deductibles. Belzley, who works for a group opposing the amendment, Coloradans for Coloradans, urges voters to look at the details. "I think when folks look at that," she says, "they come to understand this is just too risky a proposal." 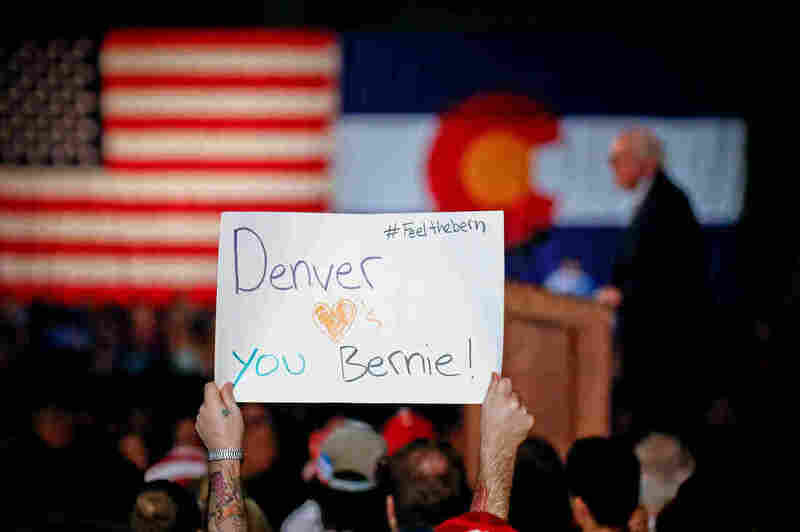 Sanders' presence in Colorado could motivate voters on both sides, says Seth Masket, a political science professor at the University of Denver. "That's kind of the mixed message of initiatives," Masket says. "They can really draw out both sides, depending on how passionate people are on the subject. The key for supporters of this initiative would be to translate passion for Sanders into passion for this initiative. Sanders is probably the best equipped to actually make that case." A representative from the Sanders campaign, Michael Briggs, says the topic is something that "interests Bernie very much. We don't have a trip scheduled yet, but he has been keeping a close eye on this."